Running this site brings a number of benefits. To continually provide original content it forces me to continuously research beyond that of the mainstream media, which I find generally contains a lot of vested interests. It also keeps me accountable to my original Retirement Investing Today philosophy. If I can’t walk the Save Hard and Invest Wisely for Early Retirement line then how can I expect others to consider following my footsteps, after having done their own research, when I’m not living what I preach. Yet so often amongst the world of “experts” we see just that. Let me give a very simple example. I’m generally a fan of The Motley Fool, particularly the forums, however take some time to read These Savvy Investors Have Just Hit The Jackpot which I thought would be relevant given I added Vodafone to my HYP back in December 2012. Besides the article being full of errors it was the last sentence that really did it for me – “Maynard does not own any share mentioned in this article. The Motley Fool has recommended shares in Vodafone and GlaxoSmithKline”. So somebody is prepared to write an article about how great something is but isn’t prepared to put any of his own skin in the game. That’s certainly not how this site works. The negative of my approach is that you the reader generally only ever see one viewpoint, which is my life. Of course the much valued Comments provide different viewpoints which benefit everyone but I also get an additional benefit, email from readers, which is what today’s post is all about. A couple of weeks back I received a well thought out email which used some of the regular data that I publish on this site but which was used to answer a different question to that which we usually look at. Some of the conclusions were also slightly contrarian. After some email banter that reader has generously allowed me to publish that email. I hope you enjoy the different viewpoint. The big question - Do retained earnings find their way to the shareholders via share price growth? After a lucky run in business I retired 5 years ago aged 40. As only a third of my portfolio earnings are paid out as a dividend I have been searching for an answer to this big question. 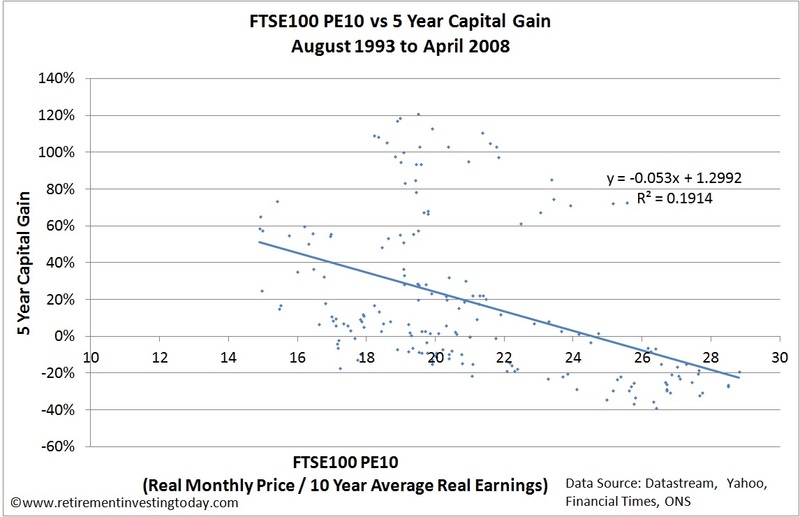 I came across your FTSE 100 Cyclically Adjusted Price Earnings Ratio (FTSE 100 CAPE) Update post and I'm certain the answer is in there but you need to look at the data slightly differently. Please stay with me as you will love the outcome. 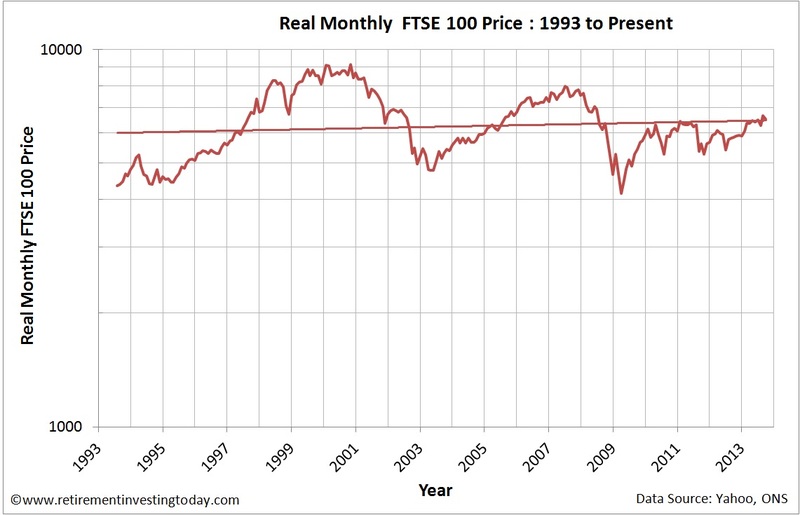 This above graph shows that the FTSE 100 has grown with inflation but not much else. In other words a portfolio spread across the index in 1993 would have earned the inflation proof 3% annual dividend payout per year and the capital kept up with inflation but nothing else. Despite no real capital share price appreciation across 20 years the above graph shows that company earning increased by 450% plus inflation suggesting that the retained earnings of the companies (typically two thirds of annual profits) were successfully deployed and are now generating the additional profits you would hope for. Note also how on average they are reliable and carry on regardless of a boom or recession. These profits adjust to any major economic shocks within two years, the 2009 big dip was the bank write off's, for everyone else it was business as usual, the world did not come anywhere near to ending! And the above graph reconciles the two previous graphs. 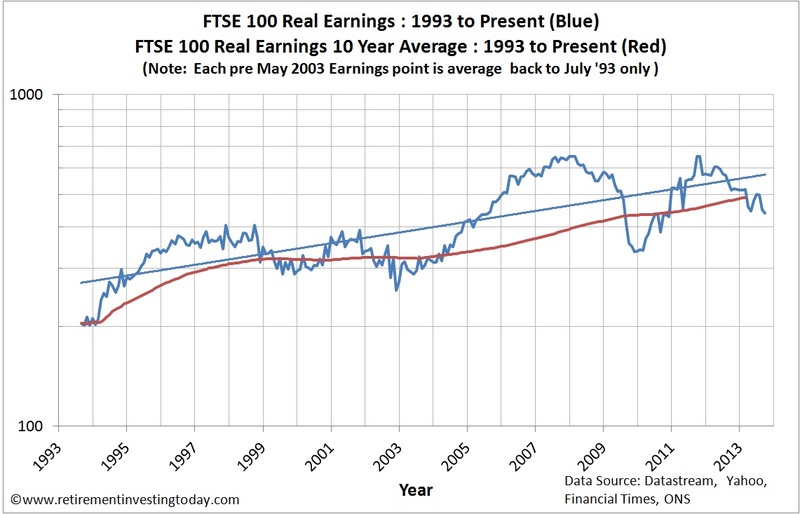 The index did not deliver any share price growth above inflation across the 1993 to 2013 period because the 1993 earnings cost twice as much to buy in 1993 as they do in 2013. 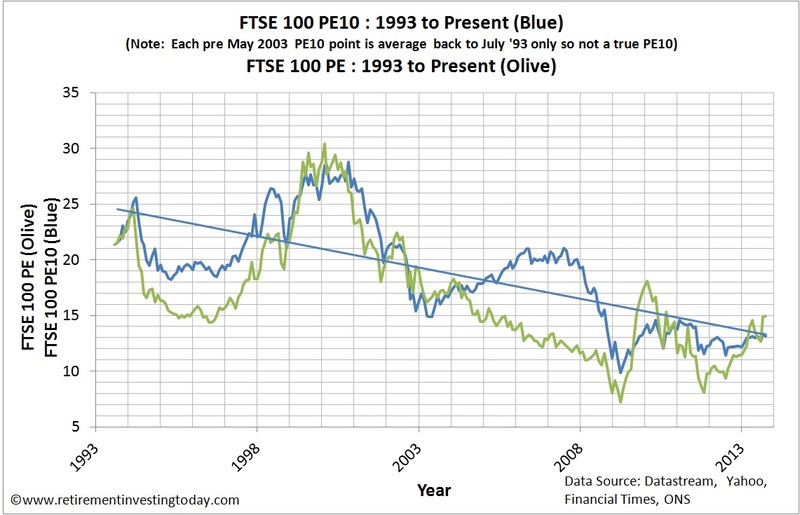 The PE of the index in 1993 was 25 compared to just 12 today. The retained profits of the companies did make its way to the shareholder via increased future earnings but that has apparently been wiped out by a change in market sentiment and its resultant earnings buy price. In contrast my company sale proceeds were booked on the market in 2008 at the 4800ish mark when the PE was 12 and it is still 12 today. The index growth from 4800 to 6500 therefore relates to 5 years inflation plus 5 years retained and successfully reinvested profits. 4800 to 6500 equals 35% capital appreciation. A PE of 12 means profits equal 8.3% of the share buy price, 3.3% of which is paid out as a dividend and 5% retained and reinvested. Add inflation to the 5% amplified by 4 to 5 years and you get the 35% capital appreciation of the index. The gain or loss from changes to market sentiment being nil as the PE is the same. What I'm trying to show you is that by using PE to strip out market sentiment changes the rest does come down to 2+2=4, or to be specific 4% dividend plus 6% retained reinvested profits does add up to a 10% annual return enjoyed by a PE of 10 investor. I hope you can see the link with PE's and capital gains is there but it is not the mystical link you are chasing via your graph above.. The trend line you have added to the graph above implies that the yield will continue to increase with time. This cannot be the case as our existence relies on everyone having to work for a living. If the current yields increased any further half the world would be within 5 years of retiring! The current FTSE100 yield of 7 to 8% means that by dodging the utilities and hyped up growth stuff you can buy a 20 plus company portfolio with a PE of 10 (10% yield) which currently could include companies like Tesco, Aviva, Barclays, BP, Debenhams, BAE, and Sainsburys. All of which have a long history of delivering profits and which the analysts predict will continue to do so. If you are able to reinvest everything along the way a 10% yield means you double up every 7 years which I think you can see is just too easy and things cannot stay that way. Putting short term shock generated spikes to one side I cannot see how market sentiment can get any lower than it currently is, however there is a massive potential upward sentiment swing which would equal higher buy prices and lower yields. RIT keep on going, although I have retired my ex business associates are all still working flat out because they used the lucky run we had to show off instead of save. Now when I get up each day I look at the weather and decide what to do - golf club, sailing club, family... I now spend more on holidays than school fees! 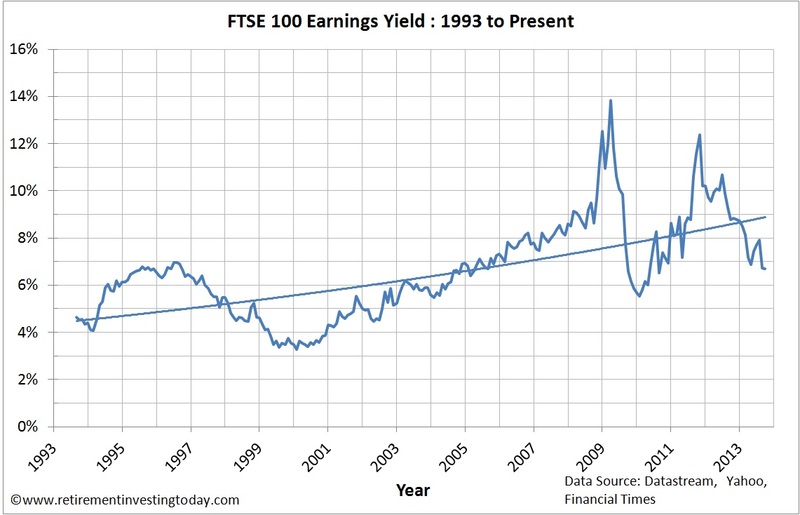 The 1993 market yields would not have facilitated that but today's are the chance of a lifetime. A final twist in my story for you. Early retirement is just the beginning. In my case, a side effect of the spare time I now enjoy resulted in the need to solve the problem of cold hands when windsurfing through the winter. I therefore invented this. My pioneer customers are suggesting I have changed the surface water sports world. A big thanks to Iain for allowing me to publish his thought. I’m not going to agree with or challenge any of the post but I am going to learn from it. It is a different viewpoint which has and continues to really make me think. If I comment then it just steers the topic back to my normal musings. Of course your Comments would be very much valued. If you’d like to share your portfolio, have a different viewpoint or even just want to share your story with other readers then please do send me an email at contact.retirementinvesting [at] gmail.com and as always please DYOR. Oh dear, warm breath to warm his hands. I had hoped that it would be warm pee. Ah well. It's quite chilly today and so, as we approach the colder months of the year, I was wondering if a version of this invention would work for cycling? It would be great if one early retiree could help an early retirement wannabee make his frugal transport choices more bearable! The system would work but it is messy - the vapour in your breath will make your hands and gloves wet plus lots of saliva around the mouth piece. In a surface water sport environment all that mess does not matter but on a bike??? If you are tempted to try it anyway, as you do not need the tubes to make a water tight entry in/out of a wetsuit can I suggest you simply go to B&Q and spend £3 on 3M of tubing and cut a hole in it at the half way point to breath into.